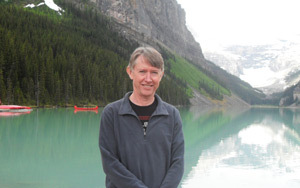 Pannell Discussions » 2010 » Ideas in economics, environment, policy and more. The ‘real’ price of food (the price with inflation factored out) has fallen through much of recent history. Back in 1995, there was a view around that agricultural commodity prices had reached a turning point and were going to stay high and rise further. I tried to have a bet with a grain price forecaster that real prices would not rise, but he refused. Would I have won? In 1995, we were doing some modelling of future agricultural production trends based on forecast prices over the following 10 years. The International Food Policy Research Institute (IFPRI) had recently published a forecast that grain prices were set to turn the corner and rise in real terms over the coming decade. Given what had occurred historically, this was a pretty remarkable prediction. 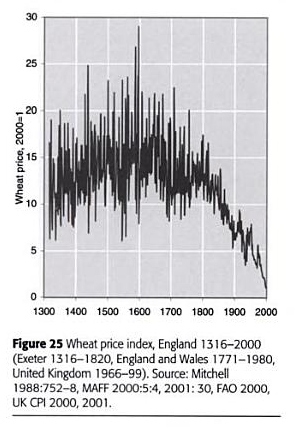 For example, the figure below shows the history of real wheat prices in England since 1300 — they’ve been falling steadily for 200 years. Source of graph: Lomborg, B. (2001). The Skeptical Environmentalist, Cambridge UP. The wheat price forecaster at the Western Australian Department of Agriculture was persuaded by the IFPRI analysis, and was providing us with bullish predictions to use in our modelling. I was very sceptical, and offered to bet him $100 that “The real price of wheat will be lower on December the 1st 2005 than it was on December the 1st 1995”. The price was to be for US winter wheat, using the Australian CPI as a deflator. This proposed bet was actually favourable to him, since his forecast was for real prices to be quite a bit higher in 2005. If he believed his own prediction, the bet was far from being a 50:50 proposition. When he hesitated, I made the terms even more favourable to him by offering that the the payoff would be the price of one tonne of wheat in December 2005. If he won, the payoff would be higher than if I won, potentially much higher. So, if we had had the bet, would I have won? Yes, easily. The real price in December 2005 was only 62% of the price in December 1995. If I had specified a different time span for the bet, would I have won? Almost certainly. Figure 4 shows that only for a brief period in early 1996 and for 12 months over 2007-08 (the “global food crisis”) have subsequent real prices exceeded those in December 1995. I would have been really unlucky to lose, and if I had lost it certainly would not have been because food prices had reached a turning point and risen steadily. It would have just been the coincidental timing of a spike in prices. Figure 2. 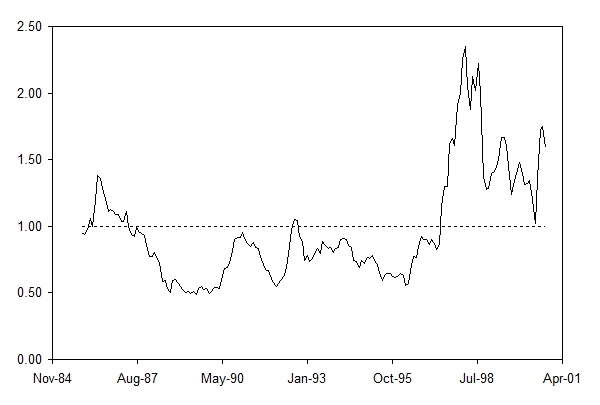 US wheat prices relative to the price in December 1995 (both prices deflated using Australian CPI as deflator). If the line is above 1.0, it means that wheat price at that time is higher than in December 1995. In December 1995 I had a big advantage; I knew that prices were at a high compared to recent history, so there was a good chance that future prices would be lower, maybe even if the trend line was actually upwards. What if I had made the same bet (over 10 years) starting at different points in time? Figure 3 shows the ratio of real wheat price 10 years later to contemporary wheat price. At times when this ratio is below 1.0, I would have won the bet. It turns out that, even without the advantage of starting from a high price, I would have won almost 70% of the time for this period. The impact of the 2007-08 price spike is obvious in the results for 1997-98, but the ratio stays above 1.0 after that, not because prices were high in 2009-10 (they weren’t), but because prices plummeted after mid 1996 and were very low from 1997 to 2002. So much for steadily rising prices! Figure 3. 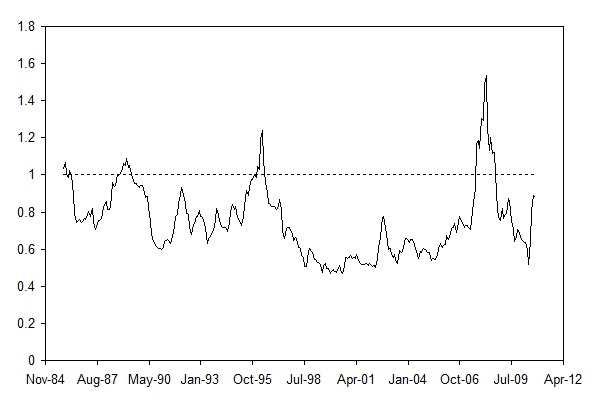 US wheat price 10 years later relative to current US wheat price. For example, the number for August 1987 shows the wheat price in August 1997 divided by the wheat price in August 1987 (both deflated using the Australian CPI). If the value on the graph is greater than 1.0 it means that wheat price was lower at that time than it was 10 years later. A key lesson from this is not to get carried away by high commodity prices. In 2007, just like in 1995, people started predicting that it was the start of an era of continuing high food prices. However, economics says that the best cure for high prices is high prices. People respond to high prices in all sorts of helpful ways so that an acute mismatch of supply and demand is rapidly overcome, and prices fall. Even if people don’t understand economics, they too easily forget history, which says exactly the same thing. Would I propose the same bet again? During a price spike, absolutely! Otherwise, probably not. Given that the world seems to be under-investing in agricultural research, and that China and India are developing rapidly, I would not expect a falling trend for real grain prices over the next decade. One way it might fall is if governments in major countries reform their biofuel policies. Currently these are contributing to higher food prices by increasing the demand for certain grains. In some cases they are reducing supply by diverting land from food production to non-grain biofuel feedstocks. They are controversial and very inefficient policies in terms of mitigating climate change, so perhaps governments will decide to abandon them at some point. I’ve been pulled up a couple of times recently for using split infinitives in my writing, once by a co-author and once by an editor. However, the idea that a split infinitive is an error is a myth. Grammar experts agree that split infinitives are acceptable and can be good. What is an infinitive? Two words, consisting of “to” and a verb. To go. To guess. To hide. What is a split infinitive? An infinitive with another word (usually an adverb) in the middle. To quickly go. To cleverly guess. To furtively hide. The rule not to split infinitives didn’t exist before the 19th century, and wasn’t widely applied until an English churchman named Henry Alford included it in his Plea for the Queen’s English in 1864. After that, the rule spread rapidly and in the 20th century was sometimes ruthlessly enforced in schools (which is perhaps the reason some people feel so strongly about it). The basis for Alford’s objection was simply that split infinitives were not used in the Queen’s English. Others objected that it had not been used in older forms of English, so we should not start now. Some (such as the Oxford Dictionary) have claimed that the prohibition was “based on comparisons with the structure of Latin”, but according to Wikipedia, this is another myth. Of the people “who ascribe the split-infinitive prohibition to Latinism, none cite an authority who condemned the construction on that basis”. So there you have it. The reason not to do it is that it’s not done — there is no logical linguistic reason to avoid it. But hold on … it is done. Particularly in spoken English, it’s very common. The only reason it’s not done more in written English is this silly baseless rule. Interestingly, the Oxford Dictionary concludes that, even though there is nothing wrong with splitting infinitives, some people object to it strongly, so it’s safest to avoid it. I say phooey to that. What a terrible reason! I care about correct, not about safe. To me, just about the strongest argument in favour of allowing split infinitives is the obvious stupidity of allowing the first four of the following sentences, but not the fifth. I always strictly enforce good grammar. I should strictly enforce good grammar. I will strictly enforce good grammar. I might strictly enforce good grammar. I like to strictly enforce good grammar. The split prohibitionists would require me to say “I like to enforce strictly good grammar” or “I like strictly to enforce good grammar“, but they both sound rubbish. I won’t do it! A couple of weeks back I attended a very good workshop in Brisbane on the Murray-Darling Basin Plan, which is causing so much political controversy at the moment. Here I’ll summarise a few key points from the workshop. The workshop, organised by John Quiggin’s group at the University of Queensland, pulled together a who’s who of Australian water economists, including Mike Young, Jeff Connor, Lin Crase, Quentin Grafton, Jeff Bennett, Peter Gooday and Alistair Watson. In addition there were presentations from other social sciences, from ecology, and from the Murray-Darling Basin Authority. The workshop came only a few weeks after the release of the “Guide” to the draft Plan, and in the wake of big public protests against the Plan by communities throughout the Basin. The key point of the plan is that there needs to be a reduction in the amount of water taken from the rivers for irrigated agriculture. This has been obvious for a long time, and has been, on its own, a point of relatively little controversy. The recommended reduction is 3000 to 4000 GL, which amounts to 27 to 37% of current diversions. This size of reduction has clearly been a concern to many people. Part of the controversy seems to be that farmers object to the government taking away their water. Given the media coverage that has occurred, most people who aren’t close to the issue assume that Government is going to forcibly acquire water rights from farmers, maybe even without compensation. This is completely wrong. To the extent that the protests are meant to protect agriculture per se, they reflect a total misunderstanding of the proposals in the Plan. The proposal is for Government to buy back water from willing sellers only. This means that those farmers who end up with less water will be, by their own judgment, better off than they would have been without the plan. If they don’t think they’ll be better off, they won’t sell, and nobody will make them sell. Thus, farmers are protesting against a program that would make the farmers who sell better off. Increasing Government purchases of water amounts to increased demand, which will result in a higher market price of water. This will obviously affect farmers who wish to buy water. I don’t think they are protesting about this, but even if they were, the protests would have little merit. The higher price would simply reflect that there are competing uses for the water, some of which are more valuable than some of the agricultural uses. It is just a better reflection of the true scarcity of water. The problem is not that water prices will be too high, but rather that they have been too low. There are some communities in the basin where job losses are likely to be more significant locally. It would not be sensible to walk away from the whole Plan as a whole on their account. Rather, strong Government support for social and employment programs would be well justified. Under the Howard government, billions of dollars were assigned to upgrading irrigation infrastructure in the Basin, as a way of saving water and limiting the need to purchase of water from irrigators. Given the controversy, this strategy probably looks tempting to the current government. Another point of strong consensus among the water economists was that this strategy is a bad idea, costing 2 to 4 times as much as purchasing water from willing sellers. Back-of-the-envelope calculations show that investing in infrastructure as a way to limit job losses would cost millions of dollars per job saved. 1. Program failure. Past experience with large natural resource management programs does not give one much confidence about the likelihood of success. The Natural Heritage Trust and especially the National Action Plan for Salinity and Water Quality spent billions for very disappointing outcomes (see PD174). The Government will need (a) a real determination to pursue outcomes, not just activity, (b) to take the science and economics seriously, and (c) allow the time and resources to undertake good quality analysis to support decisions about how the money is spent on environmental assets. 2. Uncertainty about cause and effect. There is always a lot we don’t know about the relationship between particular changes in resource use and the resulting impacts on the environment. Even with the best will, and with very good analysis, there is still a risk that our poor understanding of the system will lead to poor results. 3. Ambiguity about the objectives. At the workshop, Hugh Possingham highlighted that, when we invest in the environment, we typically don’t know what we are trying to achieve or why. My experience strongly reinforces this point. This ambiguity makes it impossible to evaluate and compare different investment options. Unusually for a long-term policy problem, it appears that we actually do have enough money on the table to achieve worthwhile outcomes. Whether we do actually achieve them will be a huge test. Note: the article has been edited to delete a comment about the effect of the past decade of drought on non-agricultural jobs. I accept a comment that was sent to me that this is complicated. Drought is not the same as permanent reduction in water — some business activities that are maintained at a loss during a drought would be shut down if there was less water permanently. In recent years, environmental economists in Australia have increasingly used a number of methods to estimate dollar values for the benefits provided by the environment. However, one hears these economists expressing disappointment and frustration about the lack of interest by policy makers and environmental managers in this work. Why aren’t they more interested? The methods are known collectively as “non-market valuation”. The most widely used are survey-based techniques, “choice modeling” and “contingent valuation”. Although I am not an expert in these techniques, I understand them well and I work with people who are experts. Also, I have been involved in developing and applying INFFER, a framework for evaluating environmental investments (Pannell et al. 2010), which includes environmental significance or value as one of its important inputs. Usually in INFFER we measure significance using a scoring system, although it is also possible to use non-market valuation. Discussing INFFER with people in a number of environmental organisations has given me some insight into why they are sometimes resistant to environmental valuation. A number of reasons have emerged. The first five issues are not specific to non-market valuation, but are equally applicable to the sort of scoring system we usually use in INFFER. 1. Ignorance is bliss. Information about the values of different environmental assets may be unwelcome because it reduces the flexibility of politicians or managers to take actions that they prefer for one reason or another (e.g. political rather than environmental reasons). A Federal Ministerial advisor was once quite open and explicit about this to me. 2. Avoidance of controversy. A senior manager in a state agency expressed concern about the risk of information about environmental values becoming controversial. It may conflict with the preferences or preconceptions of vocal or influential stakeholders, resulting in high transaction costs and stress for the agency. Avoidance of controversy is often one of the key requirements that ministers impose on their agencies. 3. Lack of any administrative process that could make use of the information. Organisations can only make use of information if they use some process or framework into which the information can be fed. In most processes or frameworks currently used by environmental organisations, there is no scope to include information about community valuation of environmental assets. Ideally, it would feed into a Benefit: Cost Analysis, but these are almost never conducted by environmental agencies. One of our motivations in developing INFFER was to provide a framework into which essential, but often-neglected, information could be fed, including information about environmental significance. 4. Satisfaction with existing methods. Although I consider most of the existing environmental decision frameworks I have seen in use by Australian environmental organisations to be weak, people tend to be highly satisfied with their existing tools and approaches. People often don’t recognise the weaknesses in their decision processes, or the consequences for decision making. However, in detailed tests of different decision metrics, I found that environmental outcomes are highly sensitive to weaknesses in the process (see PD158). Dealing properly with all relevant information really matters. 5. Subjectivity of valuation. Some people object to the subjectivity of valuation. They would prefer to limit the process to things that can be measured more objectively. However, it seems obvious that you should not ignore the fact that some environmental assets are much more significant than others (e.g. the Great Barrier Reef versus a small patch of bush in the wheatbelt), and it is equally obvious that any such comparison of values is unavoidably subjective, however the comparison is made. 6. Philosophical objections to monetisation of the environment. This is not uncommon, especially amongst people with a strong interest in the environment. The counter argument is that monetisation is just a tool to facilitate trade-offs between various real outcomes, but some of these people resist the very idea of making trade-offs, so that argument may not help much. Of course, trade-offs are unavoidable, and doing them well can improve environmental outcomes, so this purist position can be self-defeating. 7. Timing issues. Conducting non-market valuation studies in response to current policy needs would usually take too long for the policy time-frame. In practice, policy requirements for such information usually need to be anticipated well in advance, but policy agencies generally don’t do much of this sort of thing ahead of time. 8. Legitimate concerns about limitations of the methods. Some environmental decision makers are aware that there has been a spirited debate about non-market valuation amongst economists. Indeed, some economists have expressed highly critical views about particular non-market valuation techniques (e.g. see quotes in Pannell, 2004). These tend to be rather technical in nature, but one non-technical issue is the challenge of obtaining reliable responses from even quite simple survey questions. Non-market valuation surveys make pretty high demands of people to think about complex issues in abstract ways, so reliability certainly can be a challenge. 9. Preference for expert or policy-maker judgments. Economists usually argue that the people whose valuations matter are the general population. Public policy should serve the wishes of the public, not least because they are the ones whose taxes are going to pay for the environmental works. However, most environmental organisations are accustomed to relying on experts for advice, not just about scientific matters, but also (implicitly) about values. Sometimes the experts themselves don’t realise that the advice they are giving is value-laden. On the other hand, the surveyed community members in a non-market valuation study may know little or nothing about the environmental issues at stake. It’s a dilemma. In my view, it does sometimes make sense to use experts to judge values, either because of their superior knowledge, or because it is an efficient way to approximate community values. Even then, however, such values should be recorded explicitly, for purposes of transparency and accountability. 10. The high cost of doing it. A reliable non-market valuation survey requires a significant level of expenditure. Environmental managers are not used to having to bear this cost, and probably don’t have the budget to do it in all relevant cases. The following issues have never been expressed or implied to me by someone from an environmental organisation, but in my judgment they are both relevant. 11. The incremental benefits may be modest. As noted above, environmental organisations often use expert judgments to approximate community values. Another option could be to hold community meetings or focus group discussions. Given that we have these relatively cheap and simple fall-back options, what is the incremental value of a high-quality non-market valuation survey of the community? Using information economics theory to guide our thinking about this, the value of the improved information would depend on: (a) how much better the information from a non-market valuation study would be compared to an easier information source; (b) how much difference that improvement in information would make to the decisions that are taken; and (c) the extent to which the differences in decisions would eventually improve the value of environmental outcomes. In my experience, when you do the sums, the value of more precise information is often quite a bit less than people expect. Approximate information can often be nearly as valuable (e.g. see PD159), so it could be rational to use a simpler, cheaper approach to environmental valuation. Another source of approximate values can be “benefit transfer” — taking results from past non-market valuation studies in analogous situations. Although this would have lower accuracy than purpose-done surveys, it is obviously much cheaper. 12. There are many other information requirements. Environmental valuation is far from being the only information you need to prioritise environmental investments — it’s just one of the (roughly) 10 things you need to know about each investment option. In practice, we find that the biggest sources of uncertainty in these prioritisation decisions are usually uncertainty about human behavioural responses to the intervention, and about the cause-and-effect relationships between actions and environmental outcomes. These other sources of high uncertainty put a limit on the potential for greater accuracy about environmental values to improve environmental decisions. It may not be the most important information gap to fill first. Some of the reasons given for not using non-market valuation don’t stand up to scrutiny (1, 2, 4, 5 and 6, I would suggest) or could be easily addressed (3, 7). On the other hand, some of the issues raised could favour use of simpler, less costly approaches to quantifying environmental values in particular cases (8, 9, 10, 11, 12), potentially including benefit transfer. The fact that there are so many items on this list suggests that proponents of non-market valuation face quite significant challenges in getting the approach more widely and routinely used in real decision making. We are finding with INFFER that, with sufficient persistence, creativity and good communication, we can get environmental managers to accept the need for some method for quantifying environmental values, and this may be a stepping stone to increased demand for non-market valuation. The later issues on the list are, however, likely to continue to dampen that demand, at least for purpose-conducted studies. Next month marks 10 years since the announcement by then Prime Minister John Howard of the National Action Plan for Salinity and Water Quality. Anna Roberts and I conducted a comprehensive retrospective assessment of the program and its achievements, and this has just been published in the Australian Journal of Agricultural and Resource Economics. The assessment is highly negative. The National Action Plan (or NAP) was the policy response to a perceived salinity “crisis”. It spent A$1.4 billion of public funds (and drew in a larger volume of private funds) in 1700 projects over seven years. When it was announced, I was publicly critical of its design. In fact, my anger at its obvious failings was what first got me actively engaged with environmental policy. I wrote a brief paper called “Salinity policy: A tale of fallacies, misconceptions and hidden assumptions”, which went viral in salinity circles, and I mouthed off in the media and at a national conference held at that time. I gave presentations to anybody who would listen, including to senior people in the Department of Agriculture, Fisheries and Forestry, who were responsible for the program. I kept up my criticisms throughout the life of the program, but also was constructive and co-developed decision tools and frameworks to overcome some of the problems (Ridley and Pannell, 2005; Pannell, 2008). It wasn’t just me who was unhappy. There were four government reviews of the program conducted during its life (two by the Australian National Audit Office (ANAO), one by a Senate committee and one by a House of Representatives committee), and all of them identified serious concerns. The NAP did not result in the large-scale land-use change in dryland landscapes that would be needed to contain salinity. A consultant’s report near the end of the program concluded that “NAP investment by itself was always unlikely to do so, due to the lack of suitable landscape ‘best practice’ options, the scale of investment and the time required to implement landscape change and achieve a landscape response.” That was more or less what I was saying at the start of the program. A program that took account of these understandings would have been designed completely differently. The ANAO’s 2008 review was particularly damning: “There is little evidence as yet that the programs are adequately achieving the anticipated national outcomes” (Auditor General, 2008, p. 16). “Where the impact [of NAP investment] on resource condition is identified by regional bodies, the expected results were often low (frequently less than one per cent of the longer-term resource condition target)” (Auditor General, 2008, p. 19-20). I’ve heard people claim that the ANAO report did not conclude that the program was ineffective, just that they couldn’t tell whether or not it was effective. That last quote makes clear that this claim is not true. In our recently published assessment of the program (Pannell and Roberts 2010), we identified 12 criteria that it would have had to meet to be successful. The National Action Plan didn’t meet any of the criteria. Overall, with a few exceptions, its 1700 projects generated few worthwhile salinity mitigation benefits and will have little enduring benefit. One of my big lessons from the NAP experience is how difficult it is to change a policy program once it has been announced. Despite me putting forward what I still feel were compelling and very serious criticisms, and despite those criticisms basically being confirmed in the various government reviews, no fundamental changes were made to the program. Pretty early on I came to the conclusion that we would have to wait until we’d wasted that $1.4 billion before there would be an opportunity for meaningful change, and so it proved to be. Auditor General (2008). Regional Delivery Model for the Natural Heritage Trust and the National Action Plan for Salinity and Water Quality, Report No. 21 2007–08, Performance Audit, Australian National Audit Office, Canberra.